Here taking a tour of part of Havana during a Frente Frio. “Governments prior to Chavez’s fostered a deeply hostile attitude toward the Cuban government. I was lucky enough to go to Cuba a year ago. It was the first time I visited the island and I saw some very nice things, a sense of justice and living conditions which the majority of Venezuelans don’t have. I realized it was not the hell that they had spoken about for so many years in Venezuela. “Great possessions cannot be held forever. The present situation is rendered more difficult by the enormous distances, which hampers the dispatch of help, by the slowness of the authorities, and the selfishness of government… That pygmy republic (US), which today needs France and Spain to exist at all, will one day grow into a colossus, will forget all the benefits it has received at the hands of both powers, and will dream only of might. The freedom of conscience, the growth of a huge population in that vast territory, the advantages of the new government, will draw workmen and peasants from all countries, for men pursue success, and the time will come when we shall painfully feel the tyranny of the giant. It will then attempt to get Florida and the Gulf of Mexico into its power, will hamper our trade with New Spain and will attempt to conquer it, since the two countries are strong and adjacent, while we shall hardly be able to defend it. These apprehensions, Sire, are only too well founded, unless their realisation is forestalled by other, yet graver changes in our parts of America. Everything will combine to urge our subjects to fight for their independence at the earliest opportunity. Simon Bolivar was a little boy when this letter was written. Had the King followed this advice, Latin America would have been the great power it deserves to be. 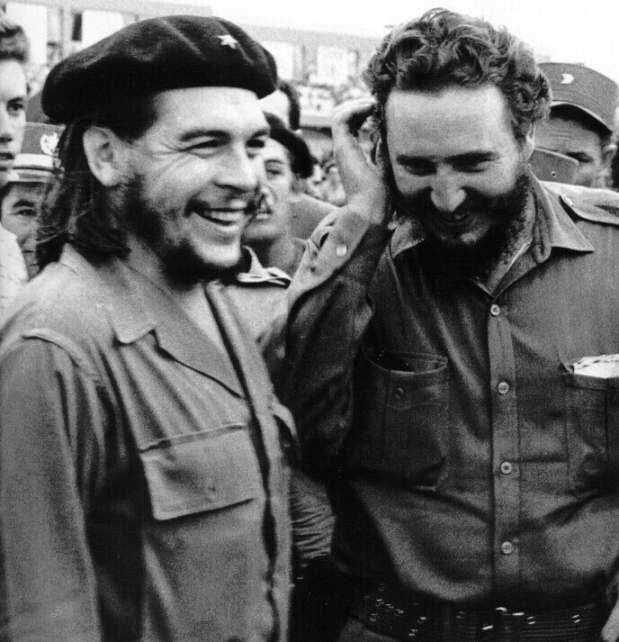 Very few people are so well known by their first names as the two heroes of the Cuban revolution. Any part of the world when you mention the name Fidel most people know that you mean Fidel Castro. The same goes for El “Che”, the Argentinean doctor Ernesto Guevara who helped Fidel overthrow the dictator Fulgencio Batista. I spent my teenage years in a Boystown on Curacao (1955-1960). Those were also the years of political turmoil on Cuba. Radio stations were few and far between in those days. Curacao had the Dutch Station Curom and the dictator Trujillo had a powerful station in Santo Domingo and the Venezuelan dictator Perez Jimenez had a couple of stations in his country. Those boys were not about to give positive news about a revolution in Cuba. And so we were dependent on the Curom and the Amigoe as well as La Prensa for our news about Cuba. 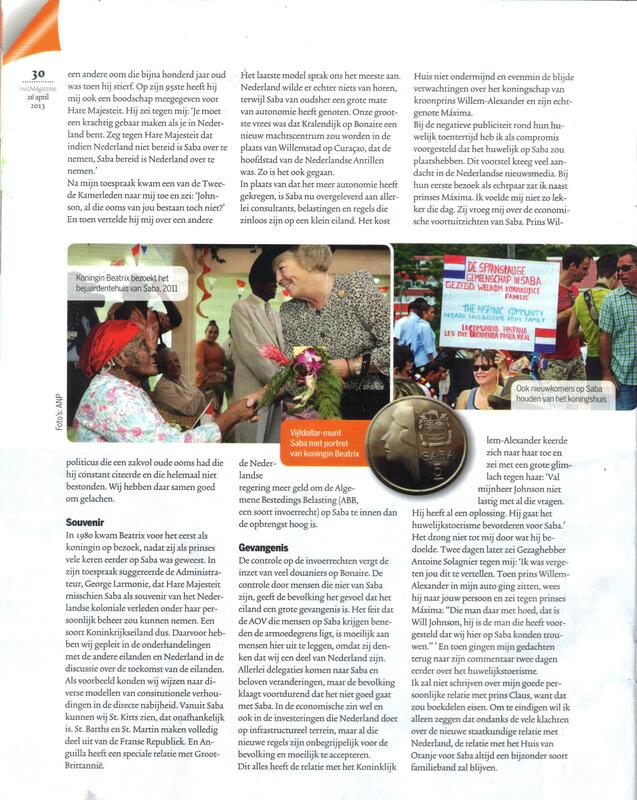 It was very exciting for us to follow the news in the last weeks before the overthrow of Batista and the aftermath. I guess it is from that time that I drank from the waters of confrontation. To a third world emerging from centuries of slavery and colonialism, Fidel and Che were considered heroes because they challenged “The Man”. They stomped on his foot and gave him a sore toe at least. While living on St. Maarten people assumed that I knew Fidel and had been to Cuba. In those days I was always dressed like a Cuban revolutionary. I remember once criticizing a trip which then Union Leader Rene Richardson had made to Cuba. Rene did not forget me. I also got Papa Godet in trouble on that trip. He was Minister at the time and leading our delegation to Carifesta in Jamaica. He was sitting in the lobby of the Pegasus Hotel where we were staying. He and Moenchin Soleana asked to come along when they heard I was headed down to the Cuban embassy to pick up my visa. 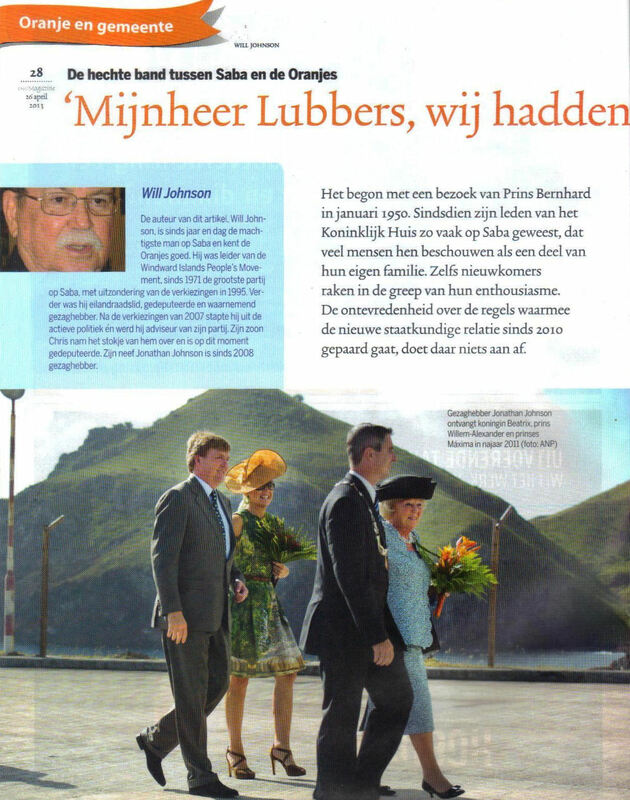 The ambassador offered Papa to send a Cuban band to Curacao which he did the following year. The Democrats used this against Papa and he had a huge setback in the elections. Anyway I was Commissioner then. The Curacao press in Jamaica had gotten wind of my intentions. “Papie” Jesurun advised me not to go. Michael Manley provided a good excuse as we were invited to lunch at the Prime Minister’s residence the next day. The Ambassador was upset but accepted my excuse as he too was at the same lunch. I promised him I would visit Cuba on another occasion. The problem is not Fidel. It is Cuba. If Fidel had pulled off the same stunt in an African country or Haiti or Pakistan, very few people in the USA would have cared. 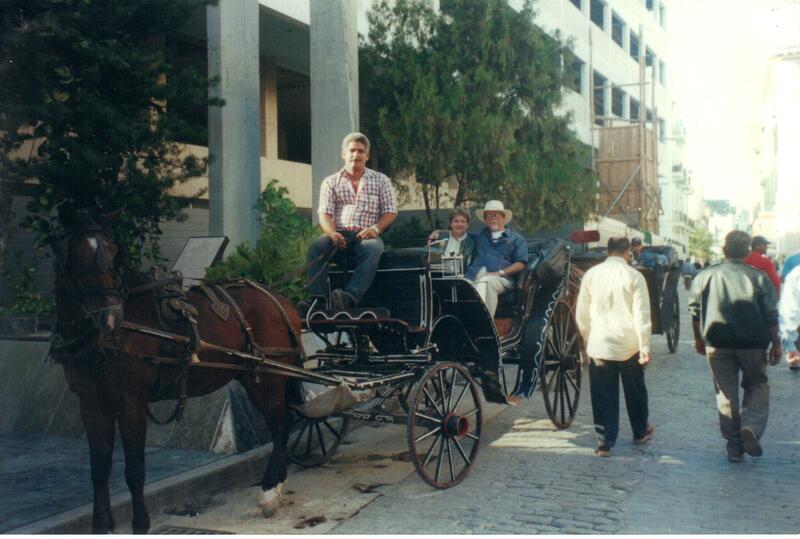 When I did go to Cuba in 1997 I confounded the immigration. I had a diplomatic passport but was on a private trip. All the generals of immigration were called in to assist the young immigration officer. Much consultation went on. No one asked me a question. I was there when the remains of Ernesto “Che” Guevara were returned from Bolivia to be interred in a monument in Santa Clara. I did not meet Fidel on that trip either. I met him in the year 2002 at a Unesco conference on education. The conference was nearly over. My wife and I were intending to go downtown Havana to take one last look around. There are those who don’t like to hear what is obvious. Fidel Castro, love him or hate him, is one of the towering personalities of the 20th century. I concluded that downtown Havana could wait till tomorrow. I wanted to see Fidel! 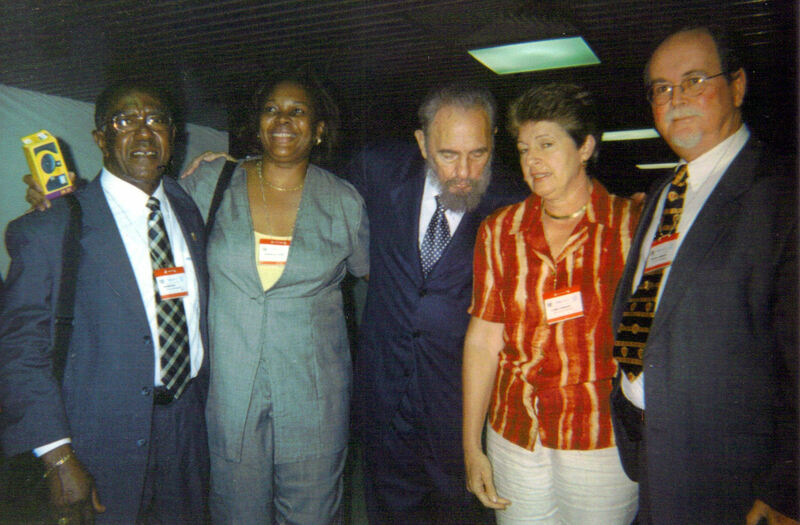 I could see from the excitement of the delegates and the reporters that somehow they too knew that Fidel was going to be there. And then as we were all seated again, he entered through a side door without being recognized by the person speaking. Fidel is a tall man. An impressive man even if he was not Fidel. He moved down the side behind people already sitting there. People were already snapping photos. When he sat down you could sense that he was surveying the people in the room. When he finally got up to speak, Roy Smith said to me: “Man he sounding weak.” I answered: “Roy when he catches his breath, you will have lost your lunch.” It was twelve o’clock and we had been invited by the Minister to have lunch at one of the beautiful villa’s formerly belonging to the Mafia. 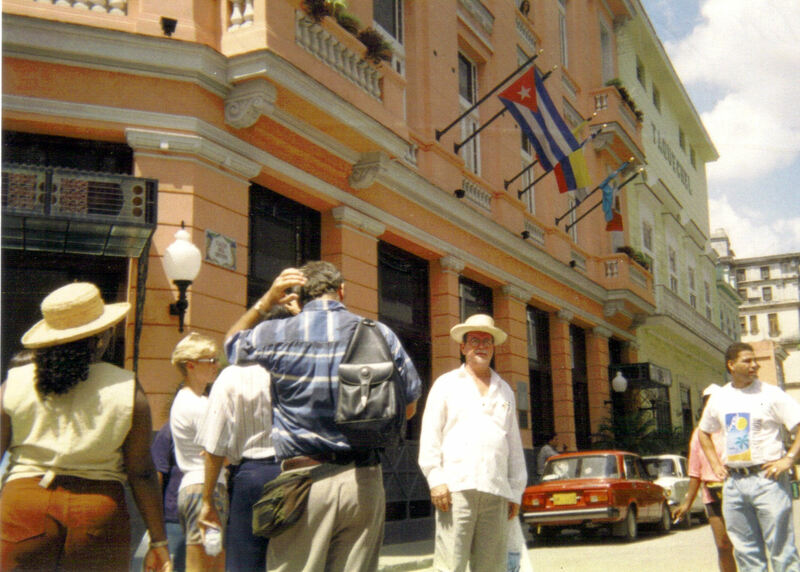 Four hours later, after rattling off all statistics on each and every school in Cuba, Fidel finally allowed us to leave for lunch at 4pm. But not before a photo session. Ms. Marcella Hazel’s camera was the only one with film. I had used up mine already. Fidel was stormed by especially the Latin American delegates. The young red head Brazilian Minister threw herself in his arms lying back as if she had fainted. Fidel ate it all up. The Brazilian photographers went crazy. “Comandante, es una gringa. Es mucho tiempo que usted no abraza una gringa, verdad? He looked at me perplexed and said: “Es una gringa de verdad?” And then we both laughed and he looked amused. So many photos were taken, but only Marcella’s survived. After that he left. Lynne and I passed at the Hotel National the following night to see a huge rally in front of the interests building of the USA. We went down on the Malecon. Among the 250.000 strong crowd, there was Fidel walking among the people while the young people on the podium were blasting US policies on powerful microphones. No one tried to shoot him. People were excited to see him and talk to him one on one. I asked myself, how many leaders of Western countries could walk among a crowd like that and socialize as if they were all aunts, uncles, and cousins? Cuba gets cold fronts at times. We were staying at the Hemingway Yacht club. He is the third hero of communist Cuba and everywhere you go you are reminded of Hemingway. I was surprised at how cold it was. The final day of our stay while walking around in downtown Havana, Lynne and I took a horse and carriage ride, and the guide knew the history of every important building we passed. As we left the Prado and came on to the Malecon, the wind was blowing hard and I held on to my hat. I fancied that I heard people shouting out my name. I said to myself;” My imagination is running away with me. Who would know me in Cuba?” So I did not say anything to my wife. A week later Roy was coming up the stairs to my office, laughing, while shouting out at me;” General, you did not hear me and Franklin shouting out at you?’ Turns out it was he and Franklin Wilson walking on the Maelcon. When I turned on to the Malecon from the Prado, holding on to my hat, Franklin said “Man, that could only be Will Johnson.” The next day they too tried the horse and buggy ride. And so that is how I met Fidel. I could end the story here but there are other tales connected to this story which cannot remain untold. Once when I was a bachelor I had a checkbook from Nova Scotia Bank, I think. I had won five hundred guilders and got a checkbook. It was depleted the same day. A bachelor, mind you, in St. Maarten at that time. I decided to put the remaining blank checks to good use. 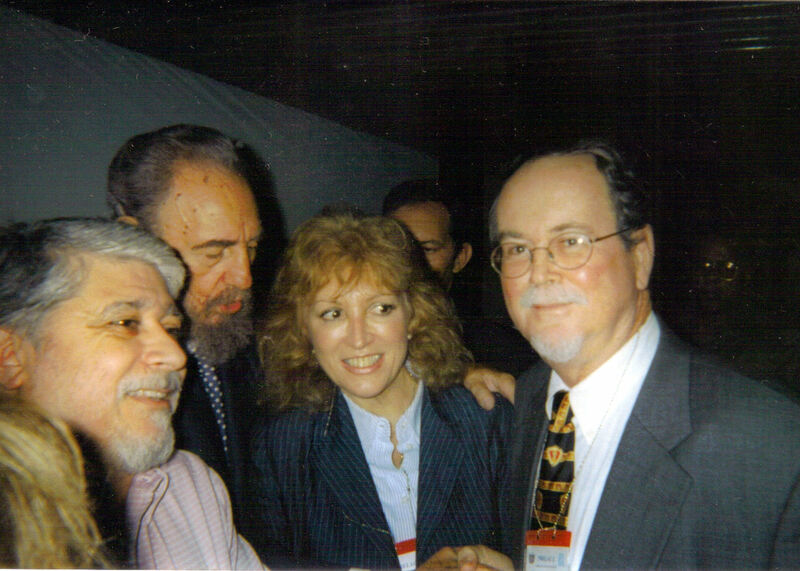 Bill Hunter had told people that he knew for a fact that I was financed by Castro. And so I wrote out a check to myself for eleven thousand dollars. I gave it to Allan Busby who worked at Hunter House at the time. Allan told Hunter that I had asked him to hold the check until I got back from Antigua. Hunter must have looked at Fidel’s signature on the check for over an hour, and was totally convinced. So much so that he could not wait to pass on the news to Claude and the boys about the check. He made some flimsy excuse about going to town to buy supplies and rushed to Claude’s office to tell about the check. So you see you cannot believe everything you hear or read. I must say though that I got closer to Fidel than many have. Cuba may be a problem for some, but it has provided good health care and education for its people. While there we visited a teachers training college. There were 4500 students and 450 professors. And what a group of wonderful young people we met there. Cuba also helps the world with doctors. The Latin American School of Medicine established in 1999 is situated in a stunning location on the sea. This medical university -there are twenty-one others on the island – is for foreign students only. There are 12,000 students from 83 countries studying medicine in Cuba, including South America (5,500), Central America (3,244), Mexico (489), the United States (65) and Puerto Rico (2). The Caribbean, with (1,039 students, and sub-Saharan Africa (777) are also represented, while 42 students come from Northern Africa and the Middle East, 261 from Asia and two from Europe. In Venezuela 17,000 medical students are being trained by Cuban doctors. Out of a population of l2 million, between 800,000 and 1 million graduates are produced by Cuban universities evey year. (Source: Tariq Ali, Pirates of the Caribbean, Axis of Hope); On that same trip we went on a private tour up into the hills about an hour from Havana. We visited an old coffee plantation which was owned by a French planter who had fled the revolution in Haiti two hundred years ago. We were touring the tropical fruit trees below the old plantation house. Suddenly we heard the piano being played. I said to our driver, “Whoever is playing that piano surely knows what they are doing.” When we got back inside there was a man playing the piano while his wife and small children stood next to it looking on. Our driver got very excited and told us it was Polo Montanez – Cuba’s most famous singer. He obliged us and allowed us to have our driver take several photographs with him. We also bought one of his CD’s from a fruit stand on our way back to Havana. We were with Polo Montanez the day before he had an accident from which he died a few days later. My nephew Dan saw the CD at my office a few days later. He said that Montanez was the top singer in Colombia at the moment and was surprised that I had met him. When Dan left the office and the Daily Herald had been delivered, I saw a photo of Polo Montanez and started reading the article. Sad to say that within twenty four hours from when we had met him he had been killed in a traffic accident. Really in the midst of life we are in death. and ask myself, how this could have been. I did not or could not have before. not in ‘Sir’, But in companero as we say in Spanish. no one can stop me at the door of a dance hall or bar. a tiny room where I can rest. what I have to eat. I have what I had to have. When Great Britain and Argentina were fighting over the Falkland Islands the Argentinean writer Jorge Louis Borges was asked what he thought about it. He loved both countries and answered that it reminded him of two bald men fighting over a comb. When the Soviet Union and the USA were about to go to war over Cuba it would have been more than two bald men fighting over a comb. Cuba as Columbus said is the most lovely island human eyes have ever beheld. And finally with tourism back as the mainstay of the economy certain traditions have returned. What Langston Hughes said of Havana in 1930, with the right connections of course, may still happen to you today. Building Coal Pits; “A Thing Of The Past”. I told Jack it was only sort of, but since I had built it, why not get a few political points out of the effort. Chris was a young boy then and we had some redwood branches and he asked if I knew how to build a coal pit. I grew up with coalpits. I remember sort of helping Joe Maxwell (Mrs. Alfreda Caines-Maxwell’s father) with his coal pits in back of where the Chinese restaurant is up above “The Alley” in the Windwardside.He used to do this for a living so they were relatively large. Large would be anywhere from 100 barrels and up. Mr. Clinton Cranston man of many trades including coal-pits. Once Clinton “Boes” Cranston made one over in “Cow Pasture” of around six hundred barrels. A barrel was five kerosene oil cans of five gallons each and the price of a tin was around three guilders. It later became five guilders a tin. The first thing to do was to collect the wood and the fresher the wood was the better. Some of the better woods for making coals are the wood of the sea grape tree, the tamarind, the guava and the cashaw and redwood trees. The last one I made was from the redwood trees in my backyard which I had trimmed for the purpose of making the coal pit. This part of the job involved much of the labour as there were no chain saws back then, only an old axe and a cutlass. Here on Saba we still call a “machete” a cutlass, a throwback to the pirate days when cutlasses were used for other purposes than the building of coal pits. The wood had to be cut up in an orderly way to fit inside the coal pit. In between the cutting of the wood the pit was dug. It was perhaps close to two feet deep and the length of the planned coal pit. It would be several feet wide. Coal pit builders would usually use the same spot over and over again but always in a location where the wood was close by as else you would have to bring the wood from a large distance. 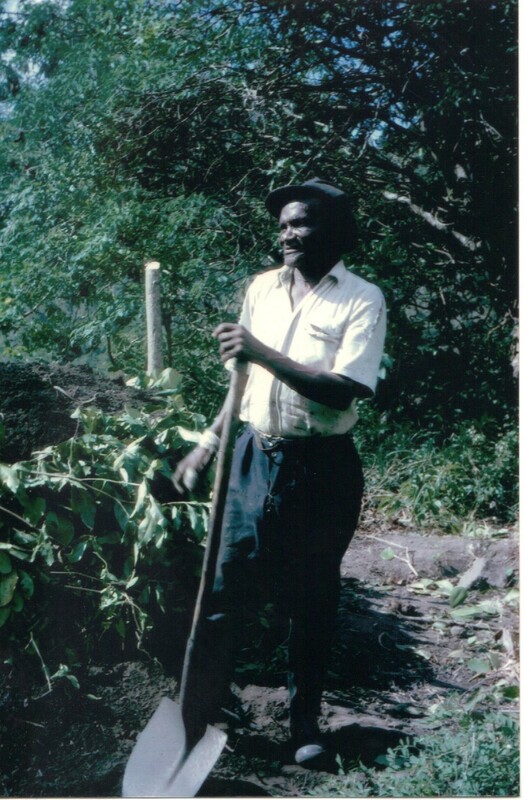 Cranston and others like the late Vincent Simmons from The Bottom would build over in “Cow Pasture” and “Middle Island” as that area has a lot of mahogony trees which is also a very good wood for the making of charcoal. 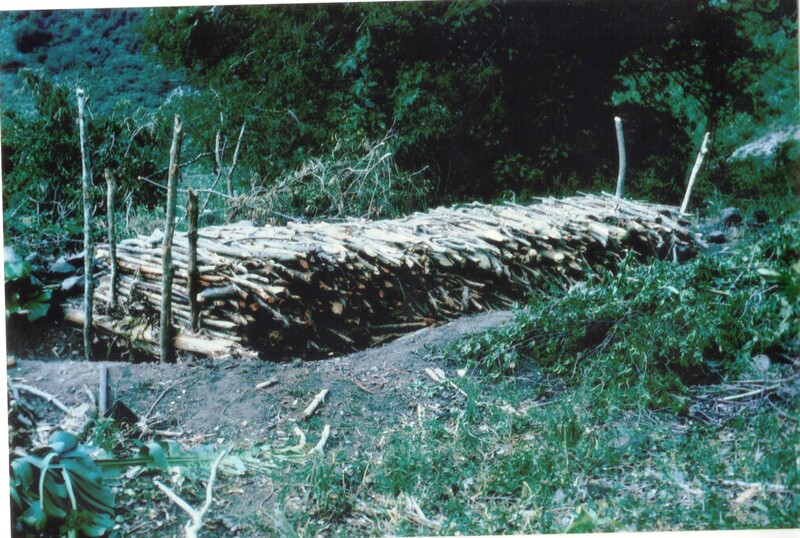 In the pit would go first of all dry wood and some leaves. 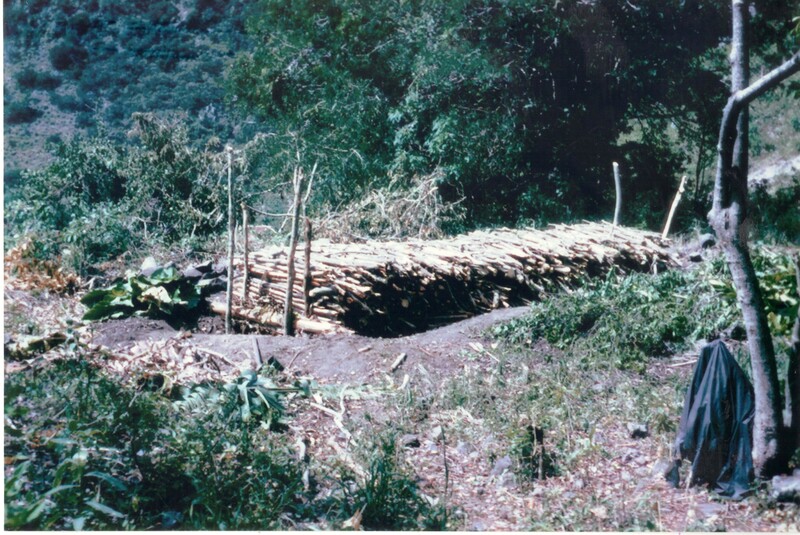 After that large pieces of wood would be laid across the pit and then the rest of the green wood would be laid down in the opposite direction until all of the wood was in place. Then you would start to cover the wood with “chinney” leaves (the leaf of the plant called the elephants ear). As much as possible would be covered with these leaves. Then the soil would be placed on top of that until there was a thick layer of soil. Three holes were left, two at the bottom, one to the front and one to the rear, and a chimney on top. This was a crucial part of the whole task and had to have your attention. Then you lit the dry bush and leaves and after a good fire was going, you would close off the back opening to encourage the “chimney” at the top of the coal pit to start drawing the fire upwards towards the green wood. After some time when you were sure the green wood had started to catch fire you would close off the front opening w ith chinney leaves and a good portion of soil and you would go all over the pit and cover it with soil to make sure that the pit was completly closed off and only the chimney at the top was open so that the smoke could escape and the fire would not go out. Depending on the size of the pit it would take a number of days even more than a week before you could take further action. During that period you had to constantly monitor the pit.If any smoke was leaking around the sides you had to cover it up with soil so that the pit did not run away from you. My coal-pit was doing fine. I had followed all the rules. Lucky for me however was that I had a meeting one night with Mr. Clinton Cranston, Mr. Elmer Linzey and Mr. Max Nicholson at the Antique Inn and I brought up the coal pit with Clinton. He was not a man of quick answers. He would carefully contemplate your question and then give you the answer slowly. His answer alarmed me as he said that when you checked the chimney and inside was all red you had to close off the chimney immediately as all you would reap would be ashes. I hastened home as before I left the house I had checked and the coal pit was already all red inside. As much as I did not want to do midnight work on a coal pit I decided to go and dig up dirt and seal off the whole pit thoroughly chimney and all. The next morning the whole thing had collpased and I feared for the worst. Also I had to wait several days before I could open up the pit to see if I had coal or only ash. Lo and behold there were nice coals, enough to fill six kerosene tins . I was satisfied!! When there is a coal pit or rather when there used to be one, some people would complain about the smell. Perhaps it is because I grew up with them and now I wish that I could smell a coal pit again. On St. Maarten they are called a coal keel and were built like a wigwam, so there was not much room for expansion like here on Saba where people used to build large ones. In an interview with Alice Scraders in Dr. Julia Crane’s book “Saba Silhouettes” she had the following to say:” Well, I’m here with Bobby. He came back. He been here five years, five years and a few months. They won’t give him no pension till he make six years, and that will be in February. He burned a coal pit in Troy since you been, and he burned up there by Rebecca’s mother’s house.” (Rebecca Woods that is). hen they saw this person dressed like a man coming through the woods with a cutlass and with a load of freshly cut wood on her head. Rebecca was well into her eighties then. They said it was surreal and it turned out to be the best part of their film. Talking about Levenstone’s. Sometime back Dave Levenstone put the question on facebook as to whether anyone knew how to build a coal pit. Now you know Dave. And next time if you have a question on how to build a coal pit or who you should cast your vote on give Uncle Will a call first. And so we remember. 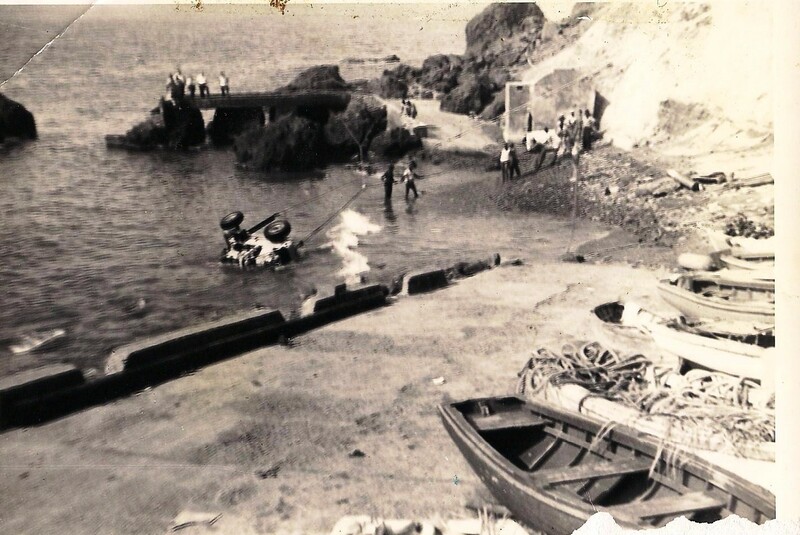 The coal pit pictured in this article was the one Alice Scraders refers to up in “Troy” and most of the photo’s were taken in 1964 by Dr. Julia Crane while she was here on Saba doing research for her book: “Educated to Emigrate“. Bobby Scraders and his coal pit in “Troy”. Landing cargo in the small boats which would then row the boat into the high seas and rocky shores of the Fort Bay. 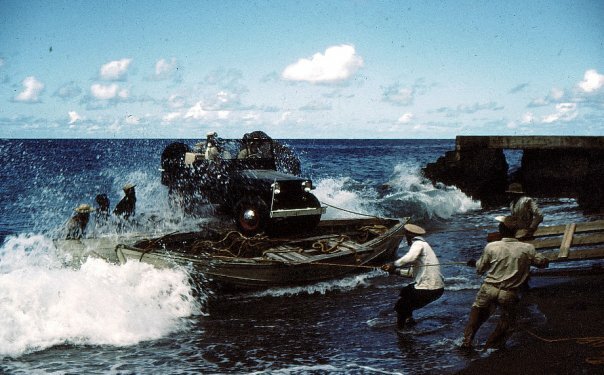 First motor vehicle, a JEEP, being landed on Saba on March 17th, 1947. From the Public Works Department on Curacao for the Administrator of Saba. 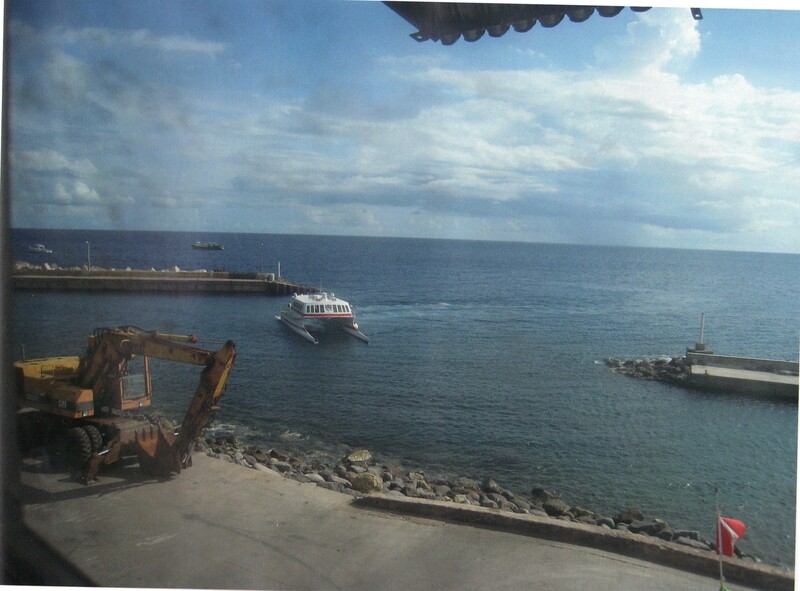 On May 5th, 2013, two days ago, I took the ferry “The Edge” from St. Maarten to Saba. As often happens the winds were contrary for the plane to land at the airport on Saba and so, many people were obliged to go back to the original mode of transportation to Saba and come back by boat. In recent years there have been numerous articles written about the plane landing on Saba which is considered the shortest commercial ariport runway in the world. Not much longer than your average aircraft carrier. The aircraft carrier even has an advantage over our airport as it can turn the ship into the best wind direction so that the planes can land safely. Our airport is more or less put in its proper place. On the boat Sunday my wife Lynne and I sat up front with the Captain as well as former Commissioner Lisa Hassell and her two daughters. It was very hot outside so we appreciated the open windows up front and could get a bit of a breeze on the way across. Capt. Austin Hodge in whose home I lived for ten years used to tell me that from point to point Saba is 28 miles from St.Maarten and from harbour to harbour the distance is 32 miles. On Sunday the sea was realtively calm. The winds were out of the South. It was bumpier than a car ride but not by much. I have experienced the “Edge” once in weather which I thought would tear the boat apart and send us to the bottom of the ocean. This trip was different. On a good day like this past Sunday the Edge usually makes the trip in one hour and fifteen minutes. She did not disappoint this time. As a boy sailing on those old sloops and schooners, some of which had no engine, it would take many hours to do the same distance. If the weather was calm as often happens after the hurricane season the old “Blue Peter” could get stuck for days between Saba and St. Maarten. Just drifting along with the tides it often happened that it took a week to get from Saba to St.Maarten. 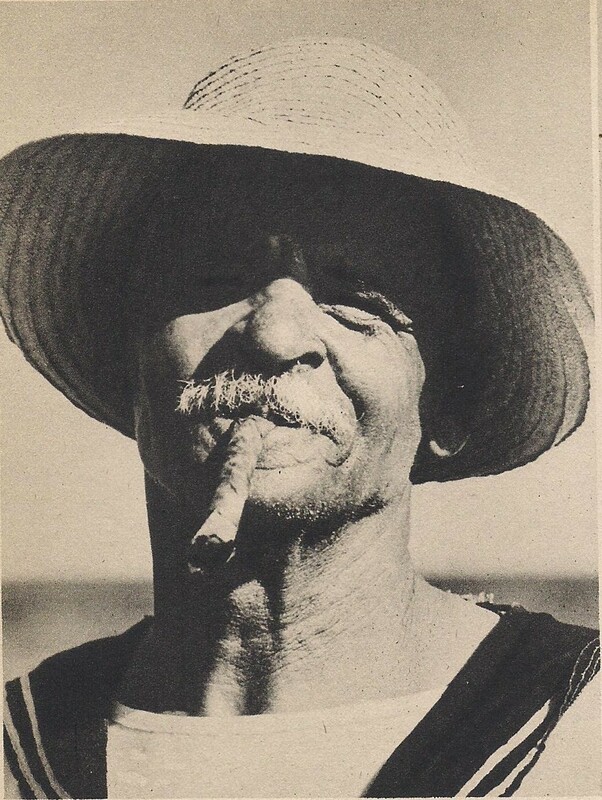 After William “Chila” Dinzey the chief boatman was William James Heyliger, followed later on by his two sons Nederville and Carlton Heyliger. Between 1629 and 1972 all landings on Saba took place at the Fort Bay and to a lesser extent at the Ladder Bay. When the “Edge” arrived at the Leo Chance pier the captain first turned her around then docked her up to the pier. There were fifty (50) passengers on board. Because of the large amount of luggage some fifteen passengers had to remain behind. Within fifteen minutes all passengers and their luggage were on the pier. This brought back to mind the many hard landings I had made over over the years at the Fort Bay. 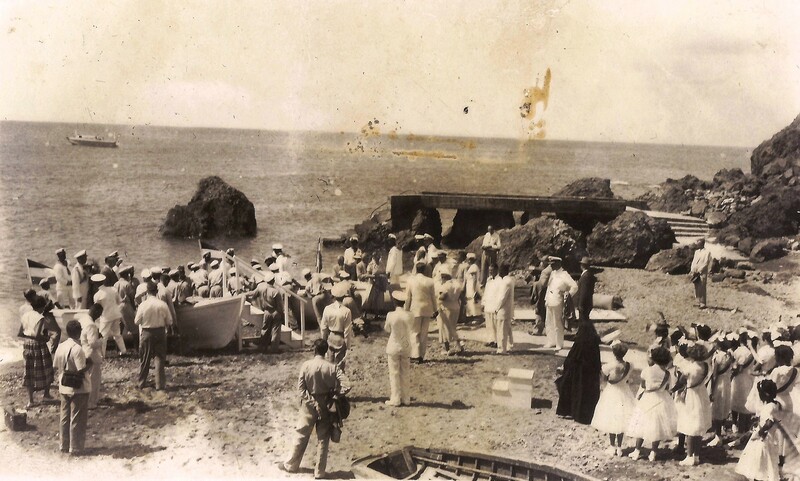 John Astor a rich New Yorker here dressed in white visiting Saba in the 1930’s on his private yacht. Back in the eighteen hundreds the boatmen were not organized. What freight was brought to the island was landed by lighter boats belonging to the owners of the schooners or family members of the owners. As the Saban owned schooners moved more and more to Barbados from which island the Saba Captains were headquartered there was some form of organization to the landing of cargo and passengers. The Government got involved as many of the people coming to Saba who were not residing here were either government officials from the other islands and people coming here with permission of the colonial government. As far back as I can remember Mr. William Rudolph Dinzey a great grandson of Governor Thomas Dinzey was the Head Boatman. Kenneth Bolles refers to him in his book of 1931 “Caribbean Interlude”. He was known as “Chila” and was born on Saba on Wednesday October 11th 1876, son of Johannah “Hanner” Dinzey and grandson of William Dinzey and Ann Eliza”Annie” Simmons. 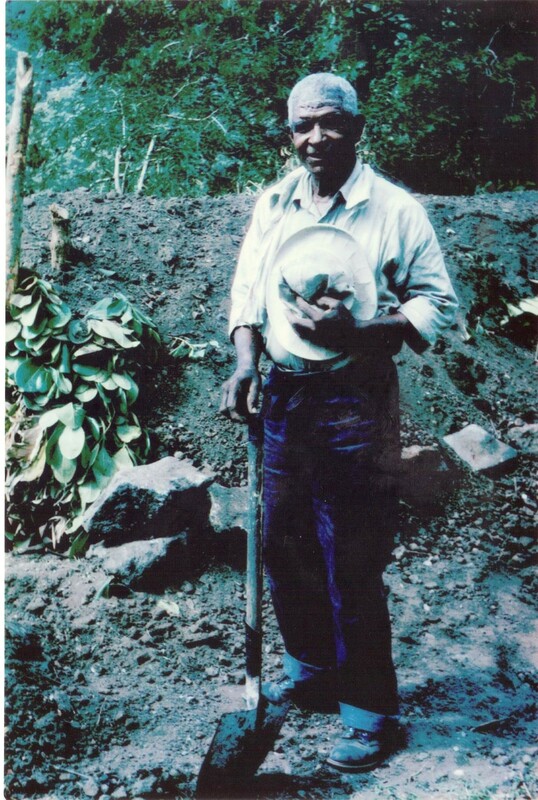 William “Chila” Dinzey great-great-grandson of Governor Thomas Dinzey was the chief boatman of the cargo and passengers boats at Fort Bay roadstead. 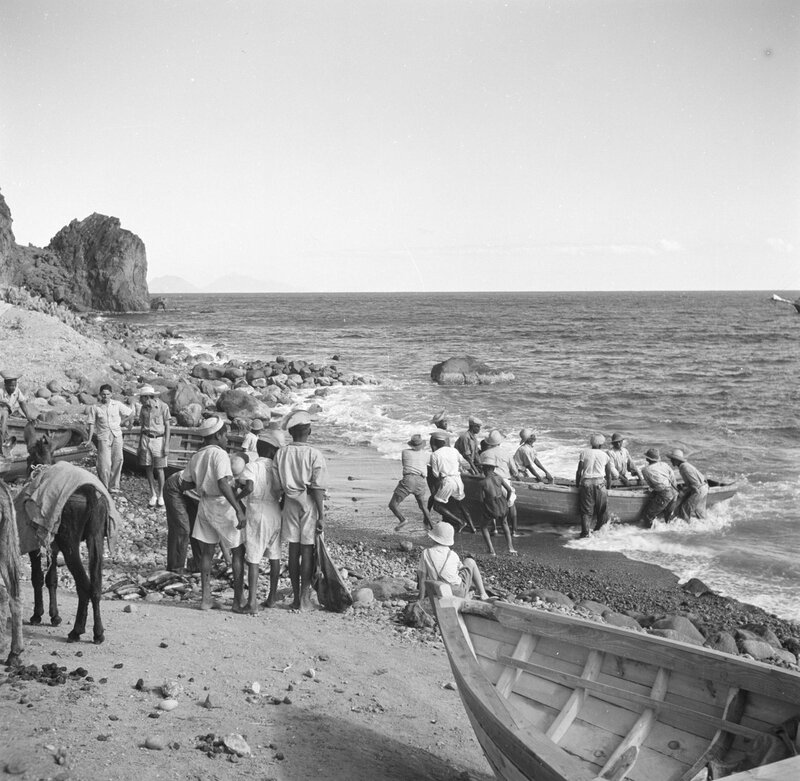 Donkey from St. Eustatius being landed into the boat. 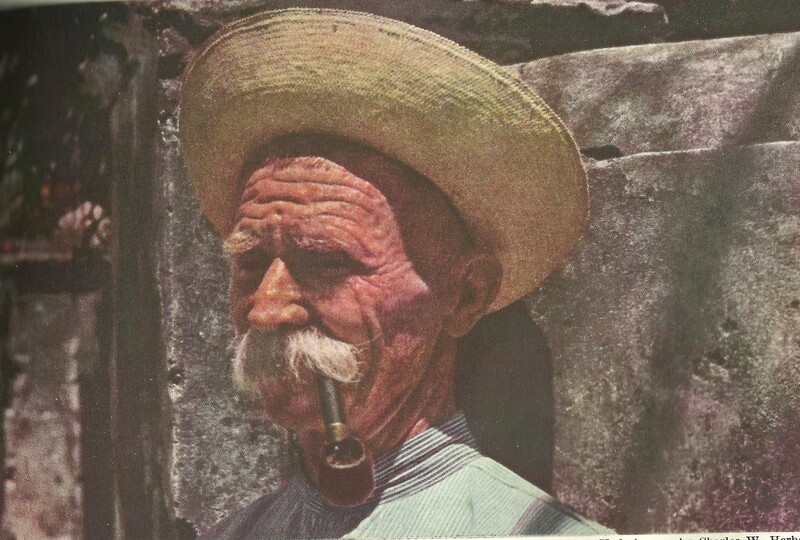 William Dinzey with straw hat was chief boatman for more than fifty years. Marion Every of Crispeen raising the signals for the boatmen in The Bottom to know that a ship was approaching and from which direction it was approaching. Being captain of the boat had a responsibility of it’s own. The Captain had to count the waves and make the decision when to give the order to row full speed towards the shore before the next wave caught up with you and swamped the boat. Sometimes the captain would wait outside the breakers for what seemed forever and then suddenly would shout out the command “Take her now” or something of the sorts. As a passenger your greatest concern was to make it to the rocky shore safely and out of the boat as quick as possible. On the shore part of the crew would be there in the water waiting to catch the boat and haul her up beyond the breakers as soon as possible. The more agile passengers would sometimes jump out and assist with pulling up the heavy boat as far as possible. 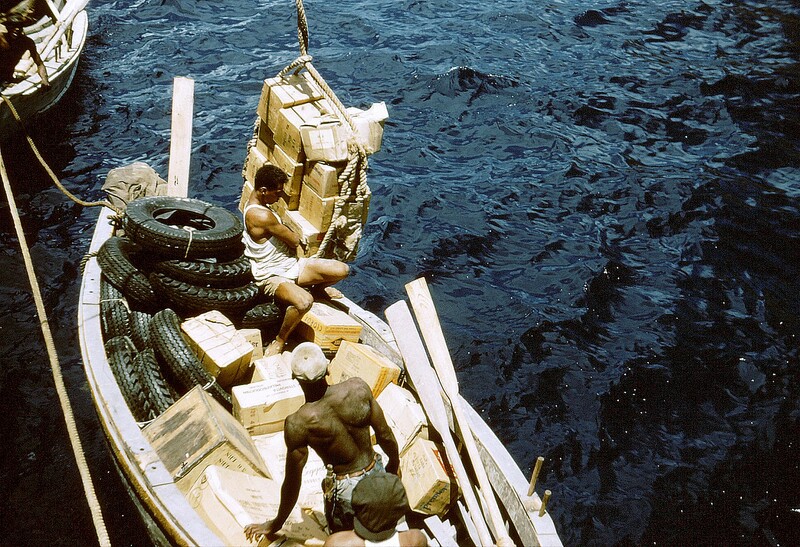 These lighter boats would be built from heavy cedar ribs from trees here on Saba and sometimes even the planks were made from the wood of the cedar tree. 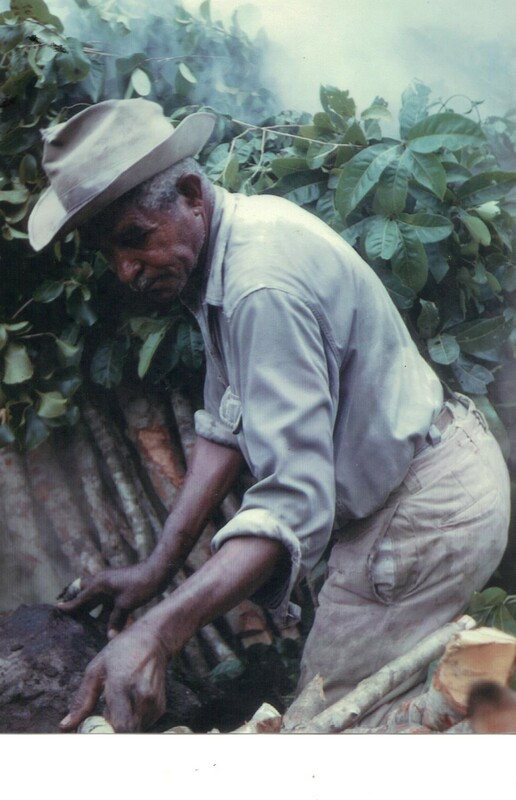 In former times people from Anguilla and other islands would come here to cut timber for making their boats as cedar was easier to work with than other hard woods. When a schooner or sloop or a motorvessel was arriving, on St. John’s at Chrispeen Miss Marion Every would give the signal from the signal station. From that spot she could see when a vessel was arriving at the island. She would give the correct signal so that the boatment who all lived in The Bottom could tell what type of vessel was approaching and could determine how many men should go down to receive the boat. 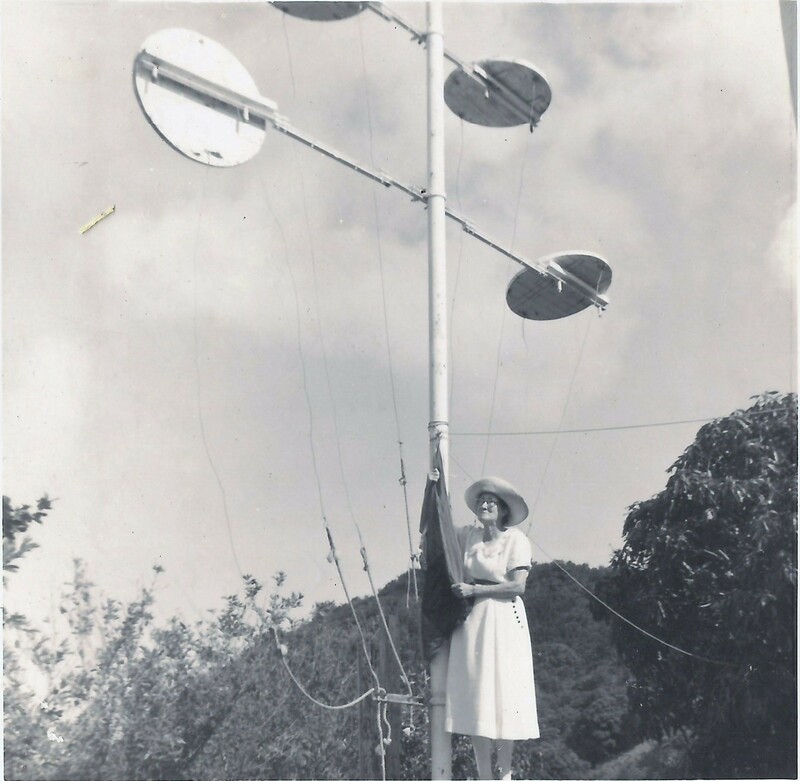 Miss Marion was a practical joker and would refer to the shape of the signals on the contraption as hers that she was going to raise. 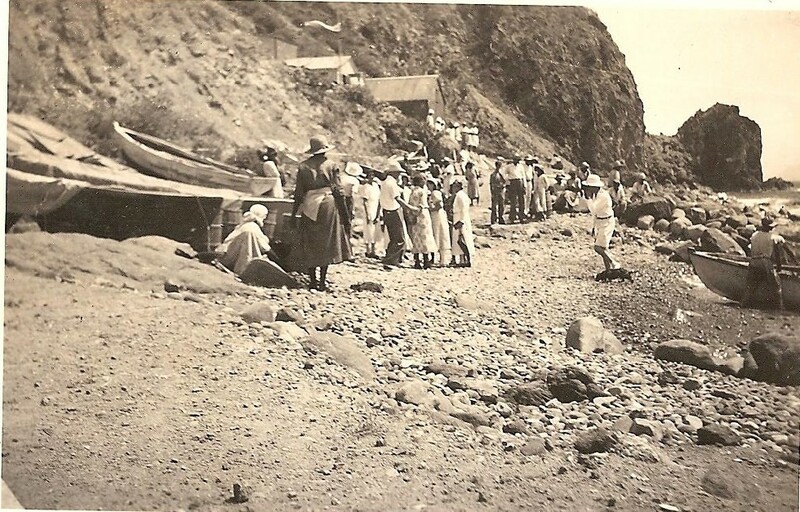 I am happy that so many photo’s connected to this sort of landing on Saba have been preserved so that people today can look back in time via these photo’s and see how different life was on Saba back then. Rowing out to welcome the newly arrived vessel. John Wilson up in the front rowing and Carlton Heyliger in back and policeman Bernard Halley in the middle. 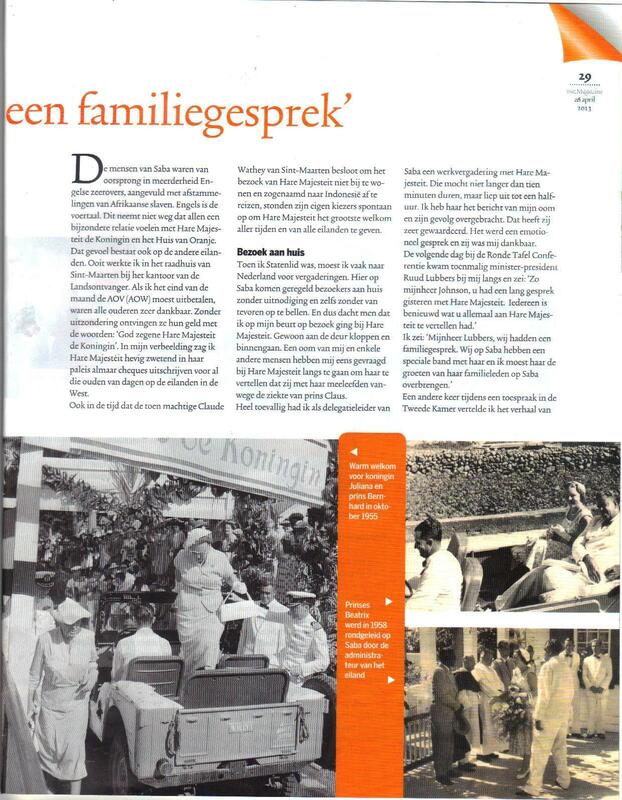 Visit of Her Majesty Queen Juliana on October 24th, 1955. The Fort Bay landing had been partially filled up by the Alice flood in January of that year. 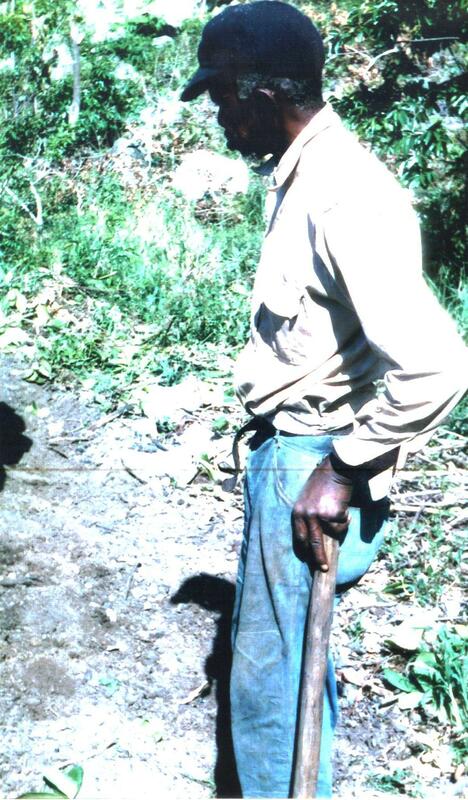 After “Chila” Dinzey became too old for the task he passed it on to William James Heyliger “Jimma” and later on “Jimma” passed it on to his sons Nederville Heyliger “Neddie” and then later when he started working as the government carpenter the task was taken over by his brother Carlton Heyliger.He was assisted by his son Stavanis Heyliger “Rumba” and they carried on until the harbour was completed in 1972. After that fishermen would use that part of the shore to beach their boats until the new fisherman’s pier was built in the nineties. 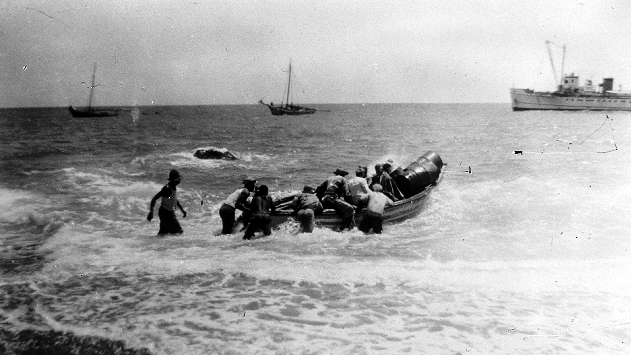 A very long period of Saba landings by boat in the rough waters of the Fort Bay had come to an end. Over the centuries of use many thousands of people would have experienced landing there including members of the House of Orange including two Queens. Her Majesty Queen Juliana and Her Majesty Queen Beatrix. Remarkable is that when members of the Royal family came here they always had extraordinarily good weather. 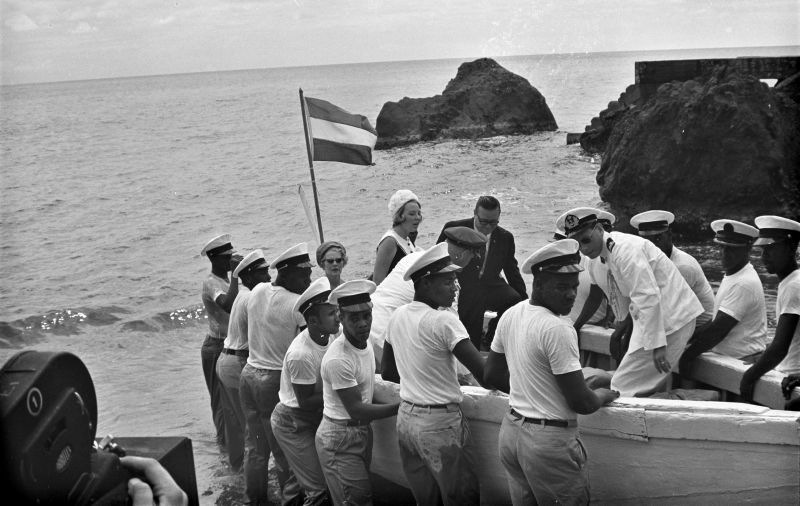 Princess Beatrix visiting Saba for the first time on February 13th,1958. Among those who landed there were people like Vincent Astor, Mrs Winston Churchill as a Member of the “Moyne Committee” in the nineteen thirties, Felix Graf Count von Luckner on July 7th 1937 who came to Saba to thank the Saban Captains who had supplied him and his famous “Sea Eagle” with supplies during the first world war, and many more people of fame. I have never heard of any lives being lost in the process of landing by boat on Saba. In over three hundred years if an average of one thousand passengers per year were landed then we are talking of over three hundred thousand people landing that way. All traffic coming in to Saba had to come in at Fort Bay. There was quite some commercial traffic with St. Kitts and Curacao, St. Thomas, Barbados, St.Barths, St. Thomas and even trading schooners from Saba would sail every two weeks to New York with freight (salt from St.Maarten, sugar from St. Kitts) and passengers from all of these islands. The Ellis Island records have schooners owned by Sabans coming into the New York harbour with more than twenty passangers and freight from the Leeward Islands. The one incident which made news was when the Saba Electric Company N.V. brought in its first 300 kw diesel engine from New York. Elmer Linzey and his aunt Mrs. Othella Edwards owned the company and Elmer had accompanied the engine all the way from New York via several islands and then had the engine transferred on Curacao to the monthly steamer the M.V. “Antilia” and in the process of landing the engine it fell overboard into the sea. But nothing could deter the Sabans. They dove down strapped the engine with ropes and everyone who could pull showed up and dragged the engine onto the shore. That same engine was cleaned up and went on to do its part of delivering energy to Saba for the next thirty years. For all I know it might still be working. The first generator of the Saba Electric Company fell overboard and with Saba manpower was pulled out of the water and worked for the next thirty years or more. 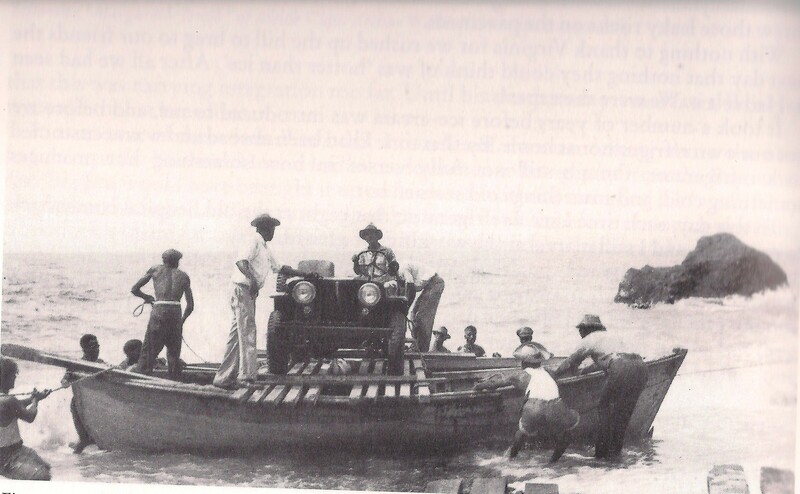 The first Jeep came to Saba on March 17th, 1947 and the boatmen had to come up with a plan on how to get it to shore. Someone came up with the idea to strap two lighter boats together, put a platform on top of the boats for the motor vehicle to rest on and with long ropes from the shore pull the contraption all the way to shore. 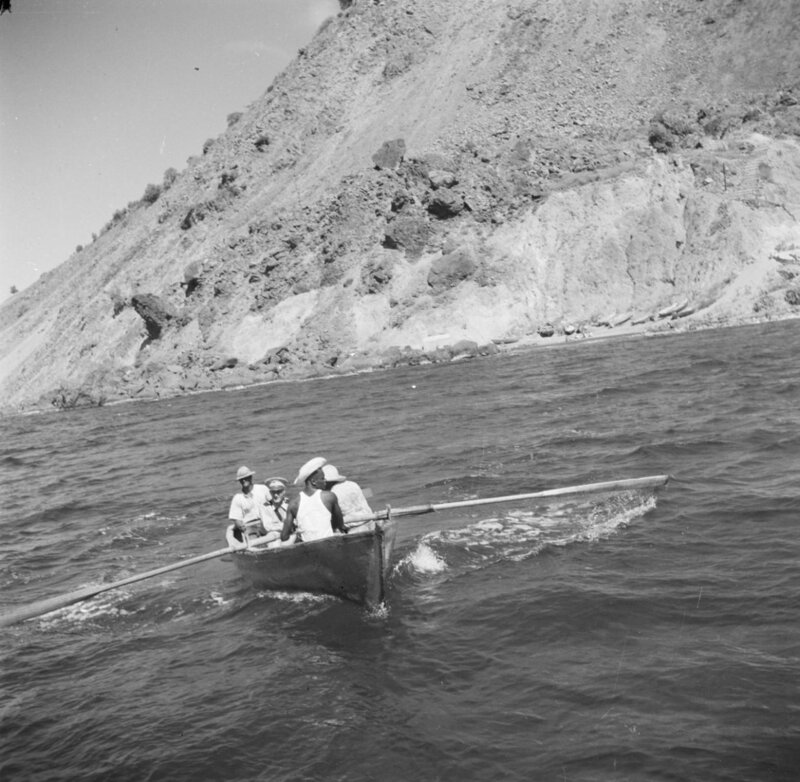 There were also two ramps which when the boat reached the shore would quickly be put against the two boats and the motor vehicle would be raced down the ramps onto the rocks and with the assistance of the men on shore be pushed quickly up to the road. Between 1947 and 1972 several hundred motor vehicles were landed on Saba this way and nary a one was lost to Poseidon and his terrible ocean waves. Chief boatman Nederville Heyliger in hat making sure that Max Nicholson’s Jeep lands safely. 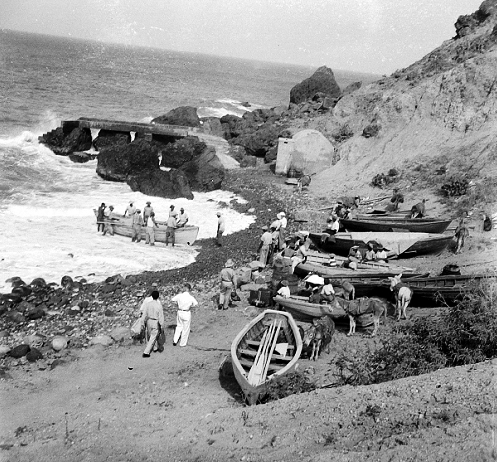 Scene at Fort Bay from the nineteen fifties. Photo Fred Fischer. This remarkable part of Saba’s history must not be lost to those who live mostly in comfort now on Saba. We salute the brave men who over the centuries risked their lives to bring so many people and so much cargo safely to the rocky shores of the Fort Bay. May their memory live on if only through this article. We look back thankfully to them for carrying us to the boats to go abroad and then later on bringing us back safely to shore. Fort Bay on a busy cargo day in the nineteen forties. The Government own M.V.”Baralt” here pictured in the nineteen thirties. Ferry “The Edge” turning around in Fort Bay harbour. A great difference from the days before the L.A.I. Chance pier was built. 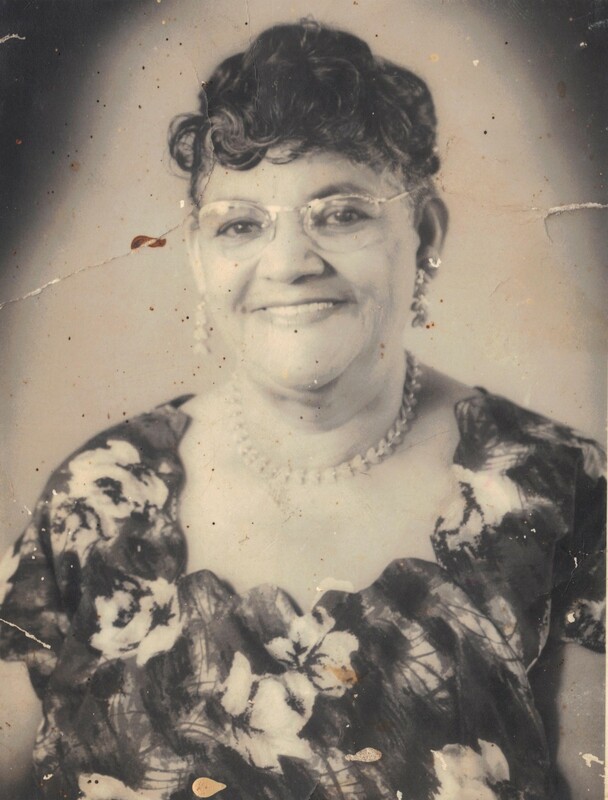 Mrs. Ada Edmead- Lopes had a guesthouse on St. Kitts. Several of the leading families on the Dutch islands also played an active role in the economy of St. Kitts as well. The largest sugar cane producing estate on St. Kitts, “Brothersons” at the turn of the last century was owned by Mr. J. G. C. Every of Statia/Saba background. His two sons were among the 14 Windward Islanders and French St. Martinets who were lost on the schooner the “Verdun” which left Nevis harbor in a hurricane on August 24th, 1924. Among those lost were the Mayor and Judge of French St. Martin, and Mr. Gaston Chance an elder brother of Senator Leo Chance. In the labor riots which broke out at Buckley’s estate in 1935 among those killed was a Simmons from Saba a foreman on the estate. 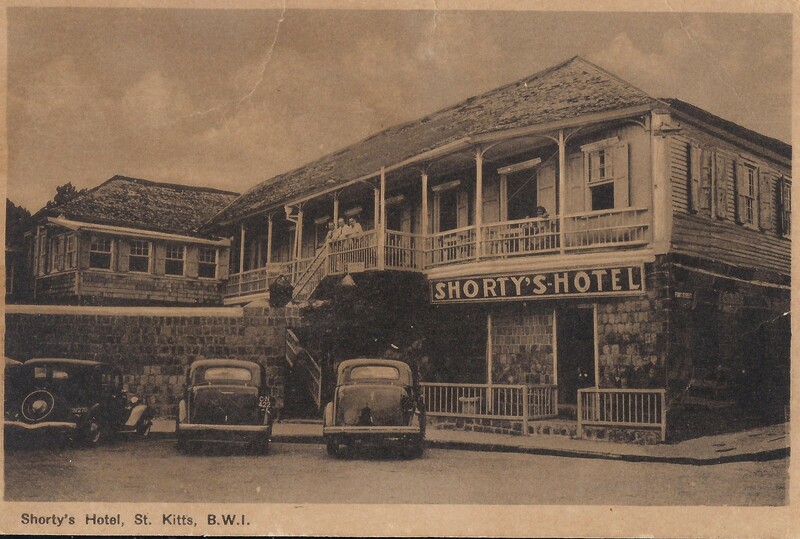 At that time there were a number of Saba and St. Barths families who had established themselves on St. Kitts. Coming to mind is Mr. Clifford Heyliger of Heyliger’s Jewelry store and across the street from him Mr. Eric Skerrit who owned the drugstore, both of whom were from Saba, and there were the Dinzey’s and so on. Capt. Ben Hassell of Saba and his brothers had extensive schooner trade relations with St. Kitts from Barbados. Capt. 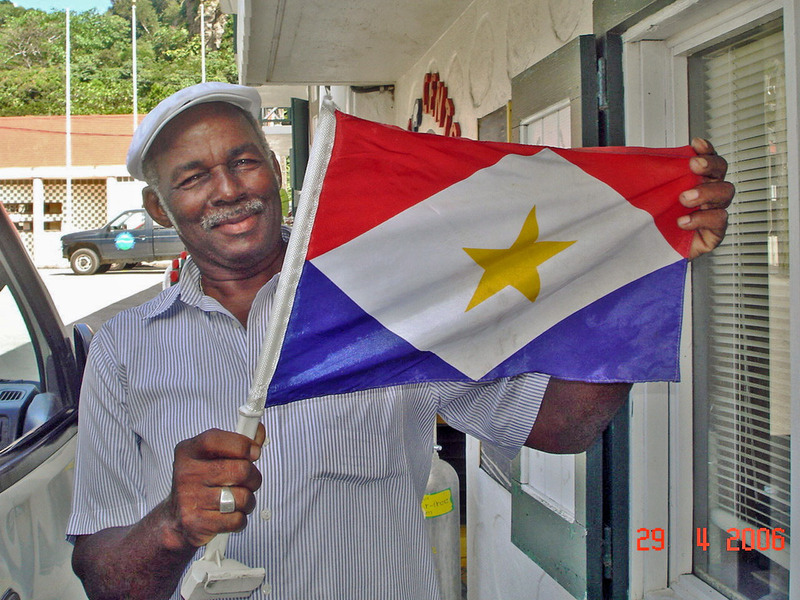 Ben is the grandfather of the Goddard family who own Goddard Enterprises and they still own businesses on St. Kitts. If you see Richard Goddard you see his grandfather Capt. Ben. 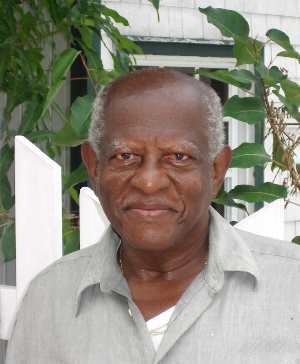 Also John Gumbs who had a large trading company was married to not one, not two, but three Leverock sisters from Saba. Those Leverock sisters must surely have sweetened Mr. Gumbs cup of tea.